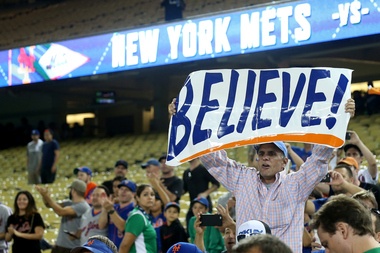 A New York Mets fan holds up a sign after the Mets 3-2 victory against the Los Angeles Dodgers in game five of the National League Division Series at Dodger Stadium on October 15, 2015 in Los Angeles, Calif.
NEW YORK CITY — After Sunday night’s impressive win against the Cubs, it looks like the Mets have a good shot at making it to the World Series. The team is now headed to Chicago, and depending on how things go, could be back at Citi Field this weekend. If you don’t have thousands of dollars to spare to see them at Wrigley Field or back in Flushing, then you may want to find a local watering hole where you can cheer the team on with some other die-hard fans. Here are some bars throughout the city to root for The Amazins. If you are in the team’s home borough but can’t make it to the game, there are still plenty of great options. This is a popular spot near Citi Field for pre- and post-game drinking. You can feed off the buzz of being near the game and may even see some former Mets stars. Hit up this classic Irish dive where you can get pub fare like shepherd's pie surrounded by Mets memorabilia, including seats from the old Shea Stadium. The game will play on a big screen in the front near the stage and smaller screens scattered throughout the bar. Dubbed “an Irish bar with a baseball attitude,” the bar’s walls are adorned with 2,500 autographed baseballs and is named after legendary Daily News sports writer Arthur “Red” Foley. The bar makes sure to play the games on multiple flatscreens with sound, so you don’t have to worry about the commentary being drowned out by drunken Bon Jovi sing-alongs. This die-hard Upper East Side Mets bar has 16 flatscreens playing the game with sound. There are also autographed Mets jerseys to ogle and classic pub grub to eat. They also have a backyard patio in case things get tense and you need a smoke. A multi-level gay sports bar with big-screen TVs, pool tables and brick oven pizza. They have a weekly $10 top-shelf cocktail happy hour from 4-9 p.m. This raucous, hipster-friendly sports bar has 12 high-def TVs and pub food, including their award-winning chicken wings. There is also a floor-to-ceiling stone fireplace in case things turn chilly again at night. A diverse crowds packs into this Fort Greene sports bar and eatery. There are multiple flatscreens in the front and a large projector will show the game in back restaurant section. This alehouse is a brick-walled, open space with lots of flatscreens, a projector and a good craft beer bar selection. The food menu includes smoked ribs, fried green tomatoes and a large selection of wings. The beloved South Bronx bar and restaurant has three flatscreens showing the game in an atmosphere that may be more accepting to Mets fans than the nearby Yankees-themed pubs. You can check their Facebook page for any potential drinks specials during the game. This craft beer and whiskey bar features seven flatscreens and drinks specials including $2 Budweiser and Bud Light, 50-cent wings and $10 one-topping pizza. They also have a pool table and large outdoor patio. This Staten Island sports bar has 14 TVs inside and three in their outside patio, so you will be sure to get a good view of the game. Former Met Lenny Dykstra is even expected to make an appearance at the bar Tuesday night, according to their Facebook page and bartender. You can also check their Facebook page for daily drink specials.